Thanks to TLC Book Tours, we're pleased to present a review for The Girl from the Paradise Ballroom, a new historical fiction novel by Alison Love. Make sure to check out the rest of the tour stops to see other reviews! I'm a sucker for a good historical fiction novel, especially one that explores different cultures (rather than just set in the American past, that is). 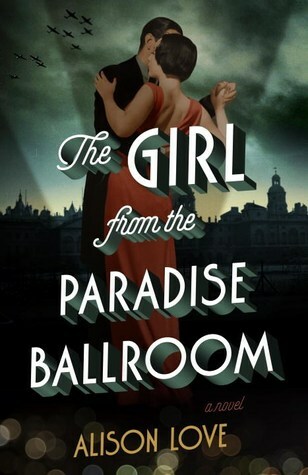 The Girl from the Paradise Ballroom excels at this, weaving together multiple storylines (Olivia the dancer, Antonio the singer, and their assorted friends and family) with the backdrop of WWII Europe. While the book has its share of romantic storylines, including some forbidden love, for me the real highlight was the slice of life type scenes we get of Antonio's big Italian family. I've read a lot of WWII era stories but I don't know that I've ever read anything that spends so much time with people who aren't British or German, or Jewish people in concentration camps. I liked getting to see how his extended family worked, how they maintained their traditions even in a country that grew increasingly hostile to them. The real highlight of this book is in its excellent cast of supporting characters to help flesh out the different worlds that Antonio and Olivia inhabit at different points in the story. While there are a lot of secondary characters to keep track of, they help give glimpses of what it was like to be a person of society, or a dancer, or an immigrant. The author did a great job of giving the backstory for the characters without ever bogging you down in too much detail or making you feel like the story's on hold while you learn about someone's past. As other reviewers have pointed out, while there is romance, the relationship between Olivia and Antonio doesn't dominate the book. So if you're looking for grand, sweeping passions, this may not be the story for you. But I personally really enjoyed the way that the characters crossed paths, and how long it took for Olivia and Antonio to get together in the first place. I like books where the romance doesn't dominate but is more of another facet in the story. I keep hearing good things about this book. I'm going to have to read it soon! I love this kind of historical fiction and I'm really looking forward to reading this book. I'm so glad you enjoyed it!